A week or so ago I was stopped in my tracks by a painting in one of the local high street galleries - I liked it so much that I bought it as a Christmas gift for my wife. As I mention here frequently (ad nauseam? ), the Contesse and I are both very keen on our local wildlife - she in particular is a very skilled photographer - and I knew she would love this picture. It is an original, acrylic on natural linen, by the Scottish artist, Helen Welsh. Helen is based in Perthshire, a little north of here; she worked for many years, very successfully, as an illustrator for the Dundee-based publisher, DC Thomson (no, she didn't draw the pictures in the Beano), and has now retired to concentrate on her original passion, painting Scottish wildlife. Anyway, by any standards a piece of original art is a bit of an extravagance here at Chateau Foy, but we are very pleased with it, and I thought some of you skilled wielders of acrylics out there might appreciate it also. 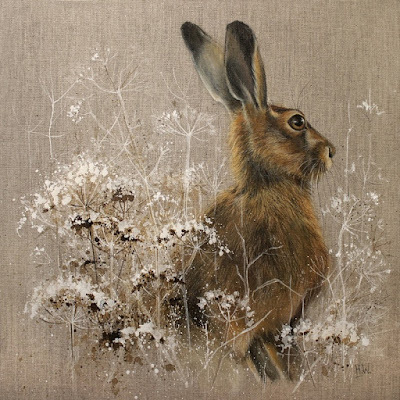 Here, then, is A Hare in Winter, by Helen Welsh. Let it serve as a simple, locally-themed greeting card to all readers of the old Aspic blog - I wish everyone a happy, peaceful, comfortable Christmas, and may next year be a little less crazy than 2016 turned out. All the best! It is a beautiful painting indeed. Merry Christmas! A very Merry Christmas to you and yours, Tony. And I loved the hare - a very handsome painting indeed. Happy Mid-Winter celebrations - nice hare.. Thanks for a year's worth of wit and joy, M. Foy. Here's hoping that your Christmas is merry, your Hogmanay is jolly, your first foot is a chap from the lottery board with a long cheque and your 2017 is a kinder, easier place than this bugger of year seems to have been for everyone. A beautiful Bunny indeed. The ability of some artists to capture an image of life so well always amazes me. I'm a bit tardy with greetings so let me hope that you had a good Christmas and wish you a Happy Boxing Day.